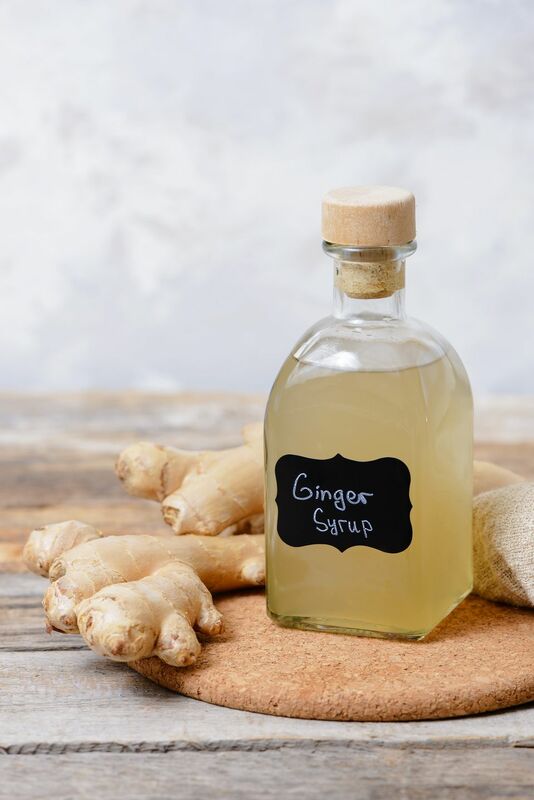 Ginger simple syrup is a very useful ingredient for the kitchen and home bar. It's easy to make at home and allows you to add the sweet spice to your drink routine. This recipe provides the foundation for making your own ginger ale. It is also found in a number of cocktail recipes. You can also want to use the syrup to sweeten tea and coffee drinks. Plus, extra flavors like vanilla and spicy peppers can be added to the syrup to really give it some zing. The recipe is extremely simple is no different than any of the other flavored syrups that you can make. Essentially, you will dissolve sugar in water over heat and add the flavoring by allowing fresh ginger to infuse its distinct taste into the syrup. It takes just a few minutes of your time. In a saucepan on medium heat, combine the sugar and water. Stir constantly until the sugar is dissolved. Add the ginger and continue to heat, bringing the syrup to a light boil. Cover, reduce heat, and allow to simmer for about 15 minutes. Remove from the heat and allow to cool and steep in the covered pan for about 1 hour or until it reaches your preferred taste. Strain out the ginger and bottle under a tight seal. Store in the refrigerator, it should keep for about two weeks. Tip: To make straining easier, slices or chunks of ginger are better. Grated fresh ginger will work as well, though you will need to fine strain it to remove all of the pieces. You can adjust the sugar and water ratio as well. Make it richer with a 2:1 sugar to water ratio or back off on the sweetness with a straight 1:1 mix. The proportions given in the recipe seem to work best with ginger as it adds a bit more sweetness against the spice, though it can be adapted to your taste. Ginger syrup does not have to be one-dimensional. The sweet spice is the perfect foundation to build on and there are a number of flavors you can add to your syrup. Vanilla: Start with something simple like a vanilla-ginger simple syrup. The vanilla adds a little more sweetness that contrasts and plays down the ginger. You can use whole vanilla beans, but a teaspoon of vanilla extract works just as well and is a much cheaper option. Chile Peppers: Another fun twist is to mix the flavor of ginger with a more powerful spice like chili peppers. You can use jalapeño, your favorite red chilies, or even a habanero pepper. This is a little tricky because you do not want the pepper to "burn" the flavor of the syrup so it must be removed before the ginger infusion is done. The key is to find a balance in the flavors and it will be different for every variety of pepper. Place a single, whole chile pepper into the syrup while simmering. If you cut the pepper and expose the white membrane that holds all the capsaicin to the syrup, it will get spicier much faster. When you remove it from the heat, taste the syrup. If the pepper infusion is to your liking, remove it and continue the ginger infusion. If not, let it go for a few more minutes. Most peppers will need just 5 minutes in the syrup during the cool down, this is especially true for those as hot as a habanero. A fun drink to try a habanero-ginger syrup in is the Chadwick, a creation of Nacional 27 in Chicago. It is made much like the standard mojito recipe, adding 1/2 ounce of the spicy syrup and 1 ounce of pomegranate juice to the rum-mint mix. The fruit-spice combo is fantastic and should spur more ideas for your ginger syrup adventures. Winter Spices: The traditional spices we associate with autumn and winter are great complements to ginger. This includes cinnamon, nutmeg, cloves, allspice, and the like. For instance, you can combine the ginger, cinnamon, clove, and allspice used in the ginger snap martini and create a syrup. This makes the drink just a little easier to mix up and the syrup is fantastic in hot toddies and coffee as well. Another example comes with the cranberry spiced syrup used in the tequila-based spiced silver bell recipe. Though ginger is not on the syrup's ingredient list, it can easily be added because ginger works with all of the flavors in the drink, including the tequila and cranberry. Plus, the cocktail already includes ginger beer. Other flavors to try with ginger in syrup include coconut, mint, and lemon or lime. Ginger syrup is actually quite versatile and can find a home in a variety of mixed drinks. You will not have syrup to spare as you explore all of these fascinating cocktails and mocktails. One of the best places to begin is with the Stoli alibi. This simple mixed drink takes a different approach to the Moscow mule, featuring club soda and ginger syrup rather than ginger beer. It has a softer profile and is a breeze to mix up. For an easy mocktail, mix up the cranberry ginger sparkler. Simply mix 1/2 ounce ginger syrup with 3 ounces cranberry juice over ice. Top the drink with sparkling apple cider and stir. It's fantastic for autumn and can be spiked with vodka, rum, or even whiskey. German Vacation: A most interesting mix of Jagermeister, rum, and ginger syrup. Mad Hatter's Tea Party: Sweet and simple, this cocktail begins with a tea-infused rum which is perfect against the snap of ginger. PAMA Ginger-tini: Pomegranate, grapefruit, and ginger, what's not to love about that? Office Party: Your tequila shot just got interesting with a little ginger and grenadine as well as a juiced red bell pepper.